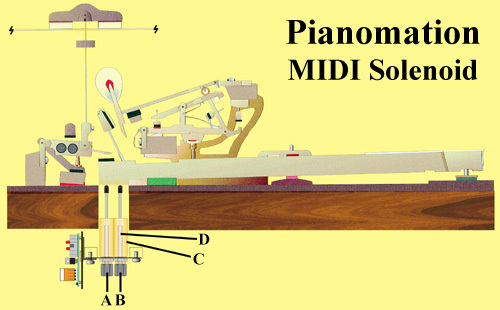 Almost any piano, old or new, grand or upright, can play by itself when fitted with the Pianomation™ Reproducing System. Its capabilities are almost limitless. It can play with the breadth and power of a great concert artist, or the suave sophistication of the finest cocktail pianist. Or, it can simply entertain you like a good old-fashioned player piano. Pianomation™ actually plays your acoustic piano, just like a fine artist. The keys move up and down, the hammers strike the strings, and the sound you hear is created by your piano, not an electronic imitation of a real piano. The Pianomation™ installation will not alter your piano's touch or tone in any way. A rail that holds the individual note solenoids that actuate the piano's keys. A power supply that provides power to the system and accessories. A computer processor that interprets the digital information from the CD or other source. A controller, which is the user interface to the Pianomation. We have several different controllers available to suit every possible application. A powered speaker that adds vocal performances and orchestrated background music to the live performance of your piano. Eliminates the potential for clicking. Eliminates variable plunger throw, thus allowing us to deliver and control the key for the exact expression required. Eliminates potential damage to the plunger when installing the action into the piano after service. A must for precision allocation of expression. Guaranteeing 128 levels of expression. Fully encased solenoid with a unique metal alloy inner sleeve specially designed for Pianomation. Built to hold tolerances in the toughest of commercial applications and environments. Hence, no mechanical deformation or noise is possible, even in continuous nonstop operation. Teflon impregnated plungers eliminate the potential for corrosion, are non-sticking, and self-lubricating. Quiet strike and release. Eliminates the potential for worn out plunger tips and knocking sound. No key will remain on for more than 16 seconds, safely eliminating potential solenoid damage. Every 1.3 seconds the system does a self-diagnosis, with auto reset. It also stores a diagnostic history. Plug a MIDI cable in and it will play without the need to go through an elaborate command menu. Courtney Lannom, Inc. has been in business at the same location since 1978. We have installed over 1700 Pianomation™ Reproducing Systems since it's introduction in 1991. Our Pianomation™ equipped pianos are found in the finest restaurants, bars, hotels and private homes all over the United States and in several other countries. Our custom installations are featured in magic clubs in Hollywood, Hawaii and Cincinnati. Have Pianomation™ installed in your piano and experience the luxury of live piano music whenever you want it. Pianomation™ is superbly engineered and will provide years of dependable service.